Today we have Tawnya Redding who is a special education teacher based in Portland, Oregon. 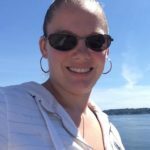 Tawnya started her blog, Money Saved is Money Earned in March 2018 and hopes to spread financial education by covering topics about saving, and tips to being frugal. Tawnya managed to pay off all of her student loans and purchase her first home all while paying for her Master’s Degree. Besides her home and a small car loan, she is completely debt free. [2:46] First, what was going on with your debt? Can you tell us your story? [5:40] What did you find most challenging when paying off your debt? [6:57] What lifestyle changes did you decide to make? [13:18] Did you qualify for any loan forgiveness? She went back to school to get a masters, she built up quite a bit of savings for her masters, she paid out of pocket! Tawnya did qualify, however coming out of the recession, she was worried about finding a job so didn’t end up applying for it, however she could’ve actually received it. [19:2] What would you recommend to someone who is trying to pay off their debt? If you haven’t already check out what a qualified retirement plan is, you can sign up for a free book here. [21:48] What is your savings or retirement plan? Bought a house recently, the real estate market has been really hot. [26:39] Do you have a favorite book? [28:49] Favorite quote you like to live by? [29:39] Any other parting piece of guidance?